Next Friday is going to be a post mostly for my writers. It’s a topic I’ve seen tackled in a few different arenas, but I’m going to throw my two cents in on getting past writer’s block (and I believe I’ll have some advice you haven’t heard or tried, because I have a couple of things I haven’t seen mentioned elsewhere). When I first started this crazy adventure into the world of e-publishing and self-promotion, I found a great site: www.bookblogs.ning.com. This is where I first met horror author Carole Gill, author of The House on Blackstone Moor. She was so very friendly from the start and soon invited me to join the Masters of Horror group on Facebook, an invitation which has opened so many doors for me, both to publishing opportunities and to simply more crazies like myself who find their pleasure in the darker side. I’m pretty sure Carole was also the one who introduced me to Vamplit Publishing (which makes sense as they are the publisher for her book) and the Friday Flash phenomenon. Every step of the way, Carole (and I would be remiss if I didn’t also mention fellow horror writer Blaze McRob) have been extremely helpful and supportive of me as a newbie in the publishing/promotion field. And I’m eternally grateful. It’s mainly my fiery passion. I do it full-time as well. I don’t think I could if the passion wasn’t there. By passion I mean I’m driven. I cannot stop writing. After I do my daily 1,000 words for my novel sequel, I turn to something else. A short story I’m working on, a flash piece for Vamplit’s Friday Flash–something. I have to be working on some sort of fiction just about all of the time. It is not a hobby, because I think hobbies are fun ways we fill up our time. My writing isn’t always ‘fun’. It’s excruciatingly hard work. It involves total commitment. It’s not easy to deal with an obsession and it is an obsession. It was always there in the background of my life, something I had no time for. It was only after a series of traumas and deaths and after a first very bad marriage that I found myself on my own and able to turn back to it. That was 10 years ago and that’s when I turned very seriously to writing. The last book was The Hellfire Club by Daniel Mannix, this is nonfiction and is for research. It recounts the story of the naughty wealthy gentry of 18th century England and all of the things they got up to in a club that purported to hold Black Masses and orgies. I think though the more I read about them (and I have actually been to the Hellfire Caves), they were actually just concerned with having a very good time if you know what I mean and little else. I am however using the caves and the research in my sequel and I will make it scary and depraved! Now I think I’ll name two fictional books. The last fiction I read was Haunted Summer by Anne Edwards. It recounts the story of Mary Wollstonecraft and Percy Shelley and Clair Clairmont her half sister as well as Lord Byron and Doctor Polidori. It’s written as though Mary Shelley wrote it which I love. It gives great intimacy to the story told in the deeply dramatic gothic narrative. It recounts that fantastic summer at Byron’s Villa Diodati when the 19 year old Mary and Polidori surprised everyone by writing Frankenstein and The Vampyre respectively. Both Bryon and Shelley were in shock as it was they who had the literary reputations! The book I am now reading is very different. 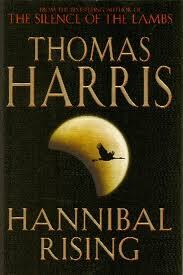 It’s Thomas Harris’ Hannibal Rising. That should give you a good insight into my writing and reading tastes. Although I love gothic and historical novels, I love contemporary thrillers. Further, I have never discovered a more perfect villain than Hannibal Lecter. He is evil beyond question but brilliantly so. No mindless killing machine. This is one clever man who happens to be a diabolical monster. And reading of his beginnings is fascinating. I think in many ways my demonic character Eco (demon spawn) who appears in The House on Blackstone Moor and is featured in the sequel, Unholy Testament owes a great deal to Dr. Lecter. He would go on to say how much he admires the doctor and finds himself studying his methods, particularly his bedside manner. Harris’ presentation of utter evil in the person of Lecter I feel is sheer genius. There are hideous secrets in the house on the moors. Nothing is as it seems. 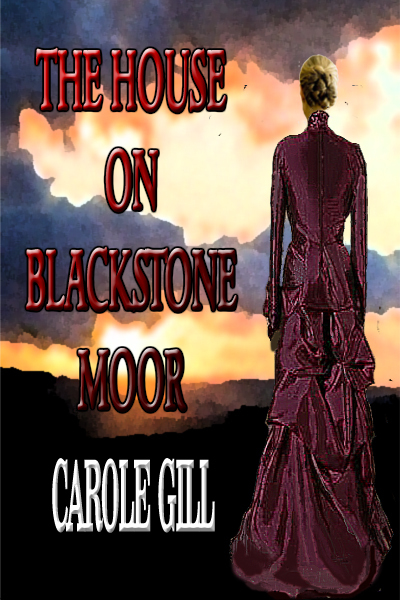 But most shocking of all are the inhabitants of Blackstone House. A demon confesses every sin committed during his timeless existence to the woman he loves. Both supernatural and human evil are explored extensively in this tale of vampirism, madness, obsession and devil worship. Rose Baines returns home to discover her family murdered by her mad, incestuous father. Thus begins this dark tale. She survives confinement in two madhouses and the terrifying horrors within, only to find her way to a lonely house on haunted moors—moors that tell of a terrifying legend, a legend of evil and human sacrifice. Yet perhaps most terrifying of all are the inhabitants of that house for nothing is as it seems nor are they. Hideous secrets are contained within that might destroy her or at least change her. The biggest obstacle is coping with the whole process in general. I am married to the most wonderful, understanding man in the world and sometimes I feel so sorry for him. I get moody and weird sometimes, and although I have a basically positive nature, I do have huge doubts and tremendous concerns along the way. I work 24/7 basically and resent (bitterly) any time away from my writing. The sequel I am working on now I began in February and as I am a seat-of-the-panster, writing with no outline, it took all this time for the story to evolve in the right way. Not easy on the nerves as you can imagine. But I cope as all writers cope because if we don’t, we don’t write, and that, Paul, is completely unacceptable. We write, therefore we are, and in many respects we are what we write. Well you know this, but many don’t. I went to acting school many years ago. This was in New York and it was the same school that Al Pacino went to (sadly not at the same time)! I took dance, voice, acting, scene study and although I liked it, I wasn’t committed to it, as a matter of fact I wished at the time I had enrolled in their playwrighting school! The actor’s training though has helped my writing immensely as I say I Method write. That is I live, feel, breathe experience the facets of my characters, whether it is first person or not. I feel all of their emotions and I love that. It makes writing that much more involving. 7- If you could spend one year anywhere (or anytime), real or fictional, money is no object, where would it be? Why? What would you do for that year? Easy! I would live in a lovely little hotel overlooking Lake Como in Italy. There would be a little balcony upon which I would have my laptop. The hotel would send up marvelous meals to me and my husband. He would be there too, happily busy with binoculars and camera. I would when not writing, comb all the museums and historical societies. Often I would take side trips to Florence, perhaps staying there as well and maybe even spotting Dr. Lecter and though guarded I would enjoy strolling along looking at the great works of art with said doctor, although I would keep a very wary eye on him! So what did you think of my first interview? Any comments that Carole made that resonated with you? Also, here are all the links for Carole. I hope you take the time and look into her stuff. 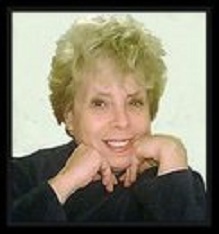 Also, Carole is a regular contributor of Friday Flash at the Vamplit Publishing blog (click here). In fact, I’ll be heading over there shortly to read her story from this week. And just like with my writing, if it’s not necessarily your thing, please pass her name along to someone you know would like her style. And don’t forget to check back next Friday for my post on beating the writer’s block. I love your comments to each answer! 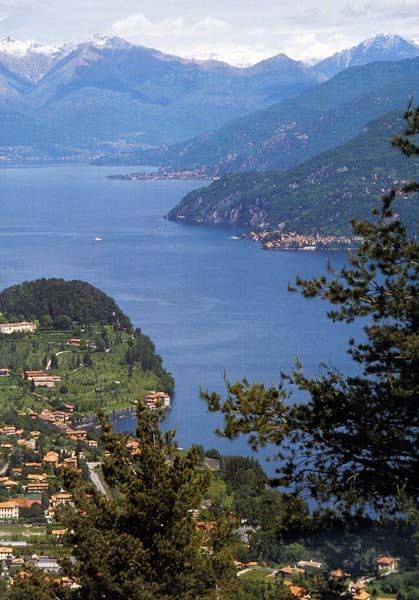 Oh that photo of Lake Como makes me swoon, now it will be hard to focus on work! Really enjoyed this, I was delighted to answer those questions. They made me think and they were fun to answer. And yeah, that was a good pic, eh? Kind of makes me want to change what my answer would be to question 7. Hope you have a good Friday. Horror was the first genre I fell in love with as a child–I still remember trying to convince my parents that no, I wouldn’t get nightmares–and I am very happy to learn about Carole’s work. It’s also wonderful that she is such a friend to elevators–Dennis Lehane calls this passing the elevator down, and I don’t think many writers would make it without authors like that. I know I wouldn’t have sold my first book. I will look up Carole’s latest-thanks for the interview, Paul! “Elevators.” That’s awesome. I’ve never heard that before. She has definitely been helpful. Thanks for stopping by, and thanks for looking into her writing. Hope you have a great weekend. Hi Paul, I loved the interview. It’s always good to see how different and yet similar we (writers) are. I loved your questions, as well as her detailed answers. Her character Eco sounds interesting. So now, of course, I must investigate more and get the first book 😉 Thanks to both of you. E, good to hear from you. And glad you enjoyed the interview. I tried to have some good questions, but she really supplied the best part in her responses. Hope you find her writing to your liking. How are things going with Boyfriend from Hell? (That’s E’s book for anyone who doesn’t know 🙂 Click on his name for more information). Hi Carol! *waves* When do I get more EVE? Pavarti, thanks for stopping by. You must know Carole, I’m guessing? So I’ll just step out and let her respond to this one. Hey wow, yup Lake Como! Jenny thank you for your comment. That’s great, that elevator! love that. what a great analogy. I’m hard at work on the sequel, the characters help me write it! thanks for that. actually the character Eco is the most fun character I have written about. He’s (like Byron) mad, bad and dangerous to know only a zillion times worse as a demon! he’s handsome, clever, charming and a complete lunatic at times. He debuts in the first book and well, he was remembered! let me put it this way, Eco meets Eve after a very hot affair with Countess Bathory and well, he’s angrier than ever with Louis because–! Sorry, still writing it, it’s going to be worth it, loads of research! but it’s coming! it really is. Right now Eco is steaming up the Crusaders so he’s a busy boy! hang on and you will be rewarded! Great interview from both of you: questions and answers. I love refreshing NEW questions. I got them here. Thank you, Paul. And of course, Carole’s answers are so delightful. It is so interesting to get a glimpse inside a writer’s head. No two heads are the same. Thanks, Blaze. It was fun to correspond with Carole on these. I agree that she had some great answers, and while no two heads are the same, it was interesting to see some commonalities. While we’re all different, we’re all a little crazy, eh? Great interview. Love the question about the obstacles she faces as a writer. People need to know that writer’s block isn’t the only issue that writer’s have to confront. On a separate note, I just bought The Imaginings and can’t wait to read it! Much thanks, Hunter. Will be looking forward to posting your interview. You had some great responses, as well. Although now I’m a little concerned about repeating all the questions (except #7) seeing as so many people have commented on how unique they are. Your opinion? Does the repetition (again with the exception of #7) take away from the uniqueness, or is it the questions themselves (as opposed to other author interviews) that make it interesting regardless of how many people are answering them? And thanks for picking up The Imaginings. I think you got the last one at .99. Well done 🙂 I look forward to hearing your feedback. And don’t worry. After almost 8 years, two editors and an agent, I have pretty thick skin. Crazy counts for a lot in this business Paul! Oh yeah, baby! I believe you are right (write? ), my friend. Very good interview, Paul. I’m sorry I didn’t get to reading it until now. Carole has become one of my dearest friends since I kick-started my writing a couple of years ago, so I knew some of these details already. I’m glad to say that I learned new things about her, too. Carole is a brilliant author and I’m so pleased to say that I know her and that I call her friend. Hey James, I’ll respond to this one in case you don’t get notified from the other comment (thanks for the subscribe, by the way). Anyway, glad you could learn some new things about a good friend. And please don’t apologize about not getting here sooner. Last week I think it was almost Thursday before I got to reading any of the previous week’s Friday Flash pieces. Life gets busy. I just appreciate you stopping by whenever you can. Hi James, hi Paul, hi Carole, hi crazy, hi write, hi right! Great interview! It made want to read her books. I really liked the answer she gave about pushing writing aside to deal with life then taking up her passion with a vengeance after a long while. Made me think about my own trials and passions. Thanks for introducing me to a new author. Thanks, Kodi. And I know your friends have been happy to see a return of your passion for life these past few years (obviously I’m thinking about one particular trial, but know that our hearts are with you dealing with your current one as well). And maybe one day we’ll see a return of the writing Kodi also. As always, glad you stopped by. Blaze, Kodi, Jimmy, Hunter and Paul! I thank you for your comments. Paul again thanks. I loved the interview. Yes, writer’s block is just one facet–it ain’t easy but it’s a committment and we know that as writers I guess which makes us understand it’s something not to be taken lightly! Paul I already feel you’re a friend. AGain thanks for your comments and for this opportunity and yes, Imaginings is on my tbr list for sure! It’s nice to have friends. Writers are a close-knit family. When friends and family are one and the same, we reach a harmony of soul and body.